Matthias Weger joined LALIVE in 2014 and has completed a number of internships at the firm in international arbitration and Swiss law. He currently works in our arbitration and litigation practice groups. Prior to this, Matthias Weger trained as a notary in Italy. 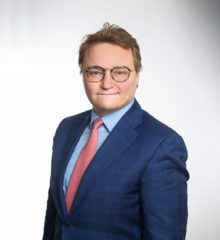 Matthias Weger holds a Master’s Degree in law from the Università degli Studi di Trento and a Master’s Degree in International Dispute Settlement from the University of Geneva and the Graduate Institute of International and Development Studies.